The film is available commercially on both DVD and video. Both feature excellent sound and good picture quality, particularly on the DVD. Oddly, the opening credits on the video version feature a bleary rendition of the title song that was never part of the theatrical version of the film. Mercifully, however, it is soon over and moments later we are treated to an exciting version of Rossini's "La Danza." The song served a similar function in The Great Caruso, but here—if anything—Lanza is even more impressive, with his voice richer and more powerful than on the earlier rendition. His concluding high A goes on forever, and is a thrilling start to the movie. One could quibble and say that the piano accordion accompaniment and the tenor are never really in sync with each other, but this doesn't bother me any more than the inappropriate echo chamber on what is supposedly an outdoor piece of singing. The important thing is that Lanza is clearly in glorious voice. The next scene is even better. Auditions had already featured in three of Lanza's previous movies, and here the scriptwriters cleverly exploit the opportunities for jaw-dropping astonishment when the tenor begins to sing, and the naysayers are put in their place. It helps that his "Torna a Surriento" is magnificent, and that he really does look as though he is singing. Although noticeably heavy in this scene, he looks in prime singing condition as he stands there in the restaurant, his black eyes shining as he soars to a spectacular high B that only he could pull off with such panache. My only regret is that the director has opted for a truncated version of the song, exposing a glaring edit on the phrase beginning: "E tu dice, 'Parto, addio!' "
An abridged and unremarkable "O Soave Fanciulla" with Jean Fenn follows, leading to one of my favorite scenes in the movie: the introduction of Vincent Price's acid-tongued impresario. Describing the unfortunate Miss Fenn's voice as "sounding like the brakes on the Rome express," Price is wickedly funny here in a delightful exchange with a very assured Lanza. "The Kendall Hale?" Mario enquires of his prospective sponsor. "I'm sure if there were any others, she would have had them shot as imposters," Price replies in typically campy vein. 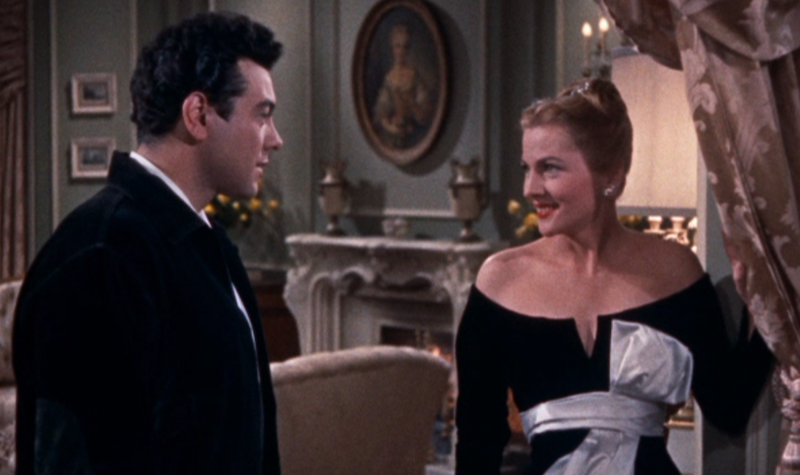 Miss Fontaine would not have been my first choice for the role of Kendall (and, reportedly, Arlene Dahl had first been considered for the part). Although she oozes vindictiveness, there is little chemistry between her and Lanza—a vital aspect if one is to believe that Mario is hopelessly infatuated with her. She should positively exude sexual power (a la Sharon Stone in Basic Instinct), but instead she merely seems conniving. The Academy Award-winning Fontaine's presence seems to have had a positive effect on Lanza's acting, however---at least in their first major scene together. Although Lanza speaks in a curiously raspy whisper that must have caused the sound technicians some consternation, his acting (and, in particular, his reactions when others are speaking) is remarkably natural here. In this scene, which takes place in Fontaine's luxurious suite, Lanza sings the melodramatic My Destiny. The song thereafter serves as a sinister musical motif whenever Fontaine's character is weaving her way inside the tenor's troubled mind. Better sung than the commercial version, Mario's lip-synching is the only flaw here as he miscues the final "my" at the conclusion of the song. Another well-written scene with Lanza and Price in a taxi follows. Apart from the fact that Mario looks disconcertingly older than in the previous scene, he performs very well here, demonstrating his awareness that a good actor should not only deliver his lines effectively, but also listen and react. Price's faith in Lanza as an actor is well rewarded in this brief scene.